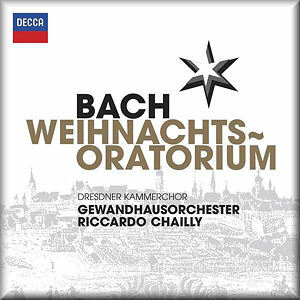 I can still remember being blown away on hearing the opening of Bach’s Christmas Oratorio while studying for A-levels at Crosskeys College of FE in South Wales. I can’t remember which recording that was, only the mesmerising image of our teacher removing dust from the LPs by rubbing them over his pullover. Anyway, that rush of fresh musical air has always stayed with me. With this new recording with Riccardo Chailly conducting Leipzig’s famous Gewandhausorchester the feeling of high-altitude musical flight is not only restricted to that stunning opening, but is now drawn into the work like lettering in a stick of Blackpool rock; to be experienced throughout the entire work. The Christmas Oratorio consists of six parts which starts with the story of Christ’s birth, and then follows the biblical narrative through the adoration of the shepherds and the Magi. Then there’s the escape to Egypt to avoid Herod’s massacre of the innocents. It celebrates not only Christmas but also New Year and Epiphany. Andreas Glöckner’s booklet notes give a usefully full account of the work’s context, content and history, and the press notes point out that, having first conducted the Gewandhausorchester in 1986, Riccardo Chailly’s association with Leipzig is now only one year less than Bach’s. Having already much enjoyed Chailly’s Gewandhaus recordings of the Brandenburg Concertos and the St Matthew Passion, I wasn’t expecting to be disappointed by this new Christmas Oratorio. I am delighted to be able to report that, even if you haven’t savoured Chailly’s ‘new’ Bach, this will provide you with a big dollop of the good stuff. That wonderfully bracing opening chorus, Jauchet, frohlocket! is taken at a cracking pace, but the mood is joyous and unrestrained rather than with any feeling of rushed compactness. As I found with Chailly’s St Matthew Passion, the approach is one of brisk and relatively no-nonsense story-telling. Briefly having a peek at timings, my old box of Helmuth Rilling’s 1984 Stuttgart recording is spread over 3 LPs, but his later recording in Hänssler Classic comes in at 144 minutes, which is about average; Masaaki Suzuki on BIS also comes in at around 145 minutes. In other words, at just over 132 minutes Chailly’s recording is one which avoids stodge and excessive lingering at all costs. This is not to say that we lose much in terms of expressive content. Sampling just a few of those beautiful chorales, and you hear a wonderfully warm choir, phrasing their Bach as if there could never be any other way of presenting it. There is a nice sense of rise and fall or messa di voce, which prevents the chorales ever becoming four-square and flat. Indeed, if something like Ich steh an deiner Krippen hier towards the end in part six doesn’t bring a tear to your eye then you are built of sterner stuff than me. This expressive shaping is also a strong element in the orchestral playing, which is thoroughly sensitive and transparent, even at full blast, where the trumpet rises in triumph. Tempi are not always tumultuously fast either. That gorgeous Sinfonia which introduces Part Two is taken with admirable restraint, lilting and almost ethereal. The soloists are all very good indeed, and I have no complaints. Martin Lattke as the Evangelist delivers his recitatives with plenty of engaging interest and without histrionics. Wiebke Lehmkuhl’s alto voice is light, more like a surprisingly low soprano than some of the thicker and, in my opinion, less attractive voices we sometimes hear in more old-fashioned and operatic Bach. This does sometimes mean that her voice projects less distinctly in places where the voice sometimes explores the lower reaches, such as with Schlafe, mein Liebster in part two, but I’ll take the compromise in volume over the gain in colour. Konstantin Wolff’s bass is suitably dramatic; once again without an over-cooked sense of melodrama, but impressive each time in communicating its message. The arias Ich will nur dir zu Ehren leben and Nun mögt ihr stoltzen Feinde schrecken don’t allow Wolfram Lattke much expressive leeway, but with a light and bouncy accompaniment he sails through these technically demanding arias in style. One of the highlights is the echo aria Flösst, mein Heiland, in which soprano Carolyn Sampson shines, reflected from afar by Maria Stosiek. Sampson has a pure and highly attractive tone colour, adapting at times with almost choirboy restraint, but holding plenty of reserves of expressive power. She and the other singers create a nice synergy in the ensemble pieces, and for me there are no weak links anywhere in this recording. If you weren’t told, you would hardly know that this performance has been recorded on modern instruments, such is the acuity of stylistic attention to period detail with which Chailly brings out his Bach from the Gewandhausorchester. Of all the three large projects Decca has released from this source I would vote this Christmas Oratorio as the most successful. This is not to say that the other recordings aren’t equally enjoyable, but this just has that ‘vibe’ which leaps out at you with a crisply welcoming embrace from your loudspeakers, making life that much more worth living every time you play it. The meltingly beautiful penultimate quartet Was will der Hölle Schrecken nun followed by that glorious orchestral and choral finale Nun seid ihr wohl gerochen together sum it all up marvellously. This is a Christmas Oratorio which is not just for Christmas, but which will bring you joy for a lifetime.